Taylor’s fourth grade class traveled to Camp Thunderbird on Monday for a field trip. One of the many things I love about being a SAHM is that I can usually go along on school outings and have a front row seat to what my kids are doing that day. So when I heard they would also be doing a high ropes course and zip line, I thought, “That sounds cool. I can do that!” Yet when we arrived at the zip line tower, all I could think of was the Twilight Zone Tower of Terror. Sure, I’ve managed to ride that several times without incident (aside from my stomach ending up in my throat), but the wooden platform with winding staircase loomed large ahead. I had to keep my cool because Taylor and I would be “zipping” side by side and I didn’t want to make her nervous. Don’t get me wrong, I knew I would attempt it although I did reconsider after putting on the harness. Seriously, it felt so snug and confining like a combination of a corset and chastity belt. (Not that I would know). So, as we climbed the stairs, helmets and harnesses on, I felt at ease. Hooked up to safety line? Check. Equipment properly on? Check. Sit down to prepare for zipping? And that’s when the helpless feeling descended. Because as you sit down, gravity kicks in and starts pulling you forward. I felt poised to fly right off the platform like some baby bird that is NOT ready to fly that gets pushed from the nest. Suddenly, a voice (our guide) reminded me that he had me and I wasn’t going anywhere until I was ready. We counted down…and leaned forward… and let go. And we were airborne! Flying, soaring, hurtling, spinning— it was AMAZING. Liberating. So effortless to just glide back down to the ground. 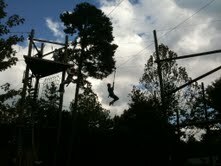 And then I couldn’t help but see the similarities in zip lining and trusting God. He has me. All the time. I am secure, held safe, not going anywhere without Him. He has a plan for where I am going. I am reminded of Jeremiah 29:11: “‘For I know the plans I have for you’, declares the Lord, ‘plans to prosper you and not to harm you, plans to give you hope and a future. '” Believe me, nothing is more reassuring when on a zip line than to know that God’s plans are not to harm you but give you a future! Still, the harder practice is to just trust Him and let go. “Trust in the Lord with all your heart and lean not on your own understanding.” Proverbs 3:5. For me that is the hardest part–letting go and getting out of my own way. Thinking I have all the answers and relying too much on myself. Especially in our society that inundates us with self-help gurus and celebrates self-made millionaires. Where you are defined not by who you are, but by what you do for a living. (If I had a dollar for every “what do you do” question… I digress.) Trusting in God more than in your own abilities is countercultural and just plain weird. But I want to be weird (does having the “be weird” Dave Ramsey sticker count?). I’ll close by recommending a website-please check out ﻿﻿www.lifewithoutlimbs.org. An amazing man from Australia with an awe-inspiring message. And yes, a man born with no arms or legs. Who also had to rely on the promise of Jeremiah 29:11 that God had big plans for his life. When asked about whether he blamed God about his condition, Nick Vujicic says, “﻿I struggled with it for many years. But, through Scriptures like John 9 and Jeremiah 29:11-14 where it talks about a hope and a future, and seeking God with all your heart, I knew that I needed to refocus my attitude toward praise concerning what I did have and to realize God did in fact have a divine plan, hope and future for my life that was good, regardless of my circumstances.” After hearing the enormous faith of a limbless man, it really puts it all in perspective, doesn’t it? Just writing this is an act of faith for me-just like my leap forward off a zip line tower. So, if you have been inspired by anything here, please take time to post a comment on my blog. I could use your voice of reassurance as I’m spiraling out here in the Internet. You can even share your “zip line” moment that reminded you to trust and let go. I’d love to hear from you. Previous Pardon Me While I Snort Next Round Two-wahoo! Oh. My. Gosh. I didn’t know you did the zip line, too! You are a good mommy. My poor kids would be zipping alone! 😉 Glad you all had fun and made great memories. Julie, it was FUN! Guess a gardener like you loves being on terra firma so it makes sense you might not want to try it. Thanks for the feedback!